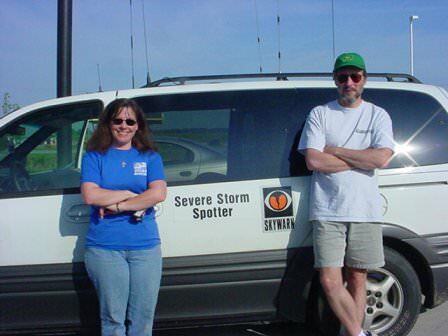 This is my 2004 Storm Chase webpage. Our vehicles were both minivans. This year, I kept a scattered journal and also captured GPS maps of our travels. I have posted these here with some of the photos from the day as well. Woke up late, got to Dave’s late. But it’s all good, it looks like it will be dead until Sunday, giving us a full two and a half days to get to where we think we need to be. Went the Northern route: 64 to 70. Picked up Kentucky and Indiana for new states for me. Lunch was at a Kentucky rest stop. Six in my van: Dave, me, Josh, Chase, and Ethan. We have a 2004 Chevy Astro. I had to take the fender off to run a wire to the battery, no useable glove compartment, battery terminals were horrible to work with, etc. 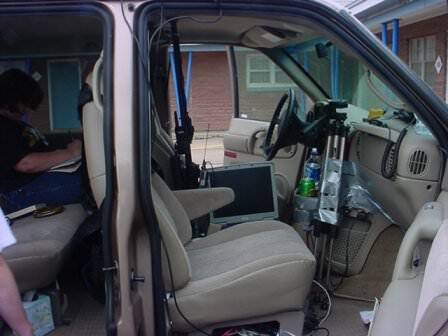 The over van is a Pontiac Montana. It was a bit easier to figure out, thanks to the Pulaski High School auto class… but when they hit a bump, the lights switch on and off. Finally got the APRS up and running. No idea what is wrong, but we have the APRS running through the Alinco. I tried to get the TinyTrak running, but no luck yet. It won’t power. I’ll try with a 9V later on tonight. Briefly ran the GPS straight into the laptop on street atlas, just as a last resort map. We thought about just drawing cartoon maps and uploading them to the webpage, just to entertain the few visitors. Made a contact on a 2M repeater on the Yaesu. Spent the night in Dale, IN, in the Ambest Plaza. $24.99 provided a pretty good room. Ate dinner and breakfast at the Family Restaurant, which was the only thing around. We are trying to decide where to go. We figure Central Nebraska is a good place, but we don’t want to get too far from CO for Monday, so it’s a chess game as to how far we will track a moderate storm tomorrow. 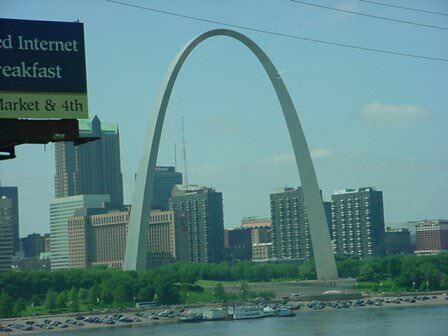 Got several pictures of the St. Louis Arch. I added Illinois and Missouri today as new states, and will probably add Kansas later today. Things died down. We have no CAPE anywhere. We are heading due west down Rt. 2 towards central Nebraska and hoping for a miracle. We have 60 knots shear in Northern Nebraska, but no CAPE. If we had CAPE around 4000 J/kg instead of 40 J/kg, we would be chasing a pretty severe outbreak. Yesterday, we took 70 to 29 to Rt. 2. I didn’t add Kansas, but I did add Iowa and Nebraska. I got a picture of how flat Nebraska is. One stretch around Rt. 2, you can see for quite a few miles. We stayed at the Apple Inn in Nebraska City, NE. 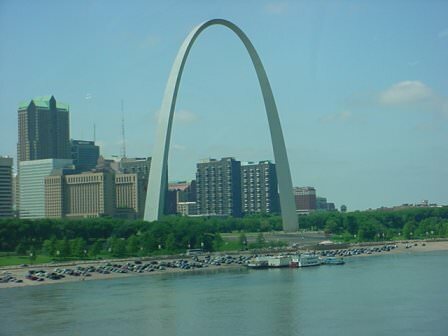 The people in that town were not too friendly, lots of Eminem fans between the ages of 14 and 20, just looking for fights. APRS is up and running, though digipeaters are somewhat scarce. Dad sent me a track that he had been compiling. No contacts on 144 or 440 since the last post. We might head towards northern Kansas, since it has a risk for tomorrow, and we might get out from this light cirrus shield. We headed out I-80 to the Holdrege exit, only becoming deeper into the cloud shield. 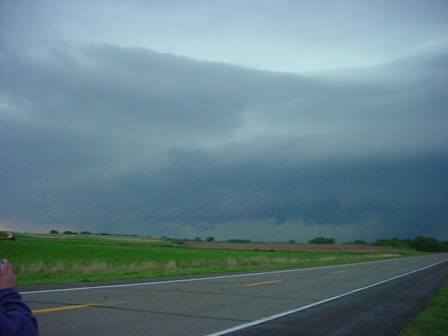 We turned around and are headed back to Lincoln, NE, as we anticipate a severe storm watch to be issued for that area. The cirrus shield has burned off down there, the temperature increased, the surface winds picking up, etc. If anything happens it will be later tonight. We aren’t too far from Lincoln, so it isn’t too far of a hike. Made one contact on 2M, and heard some guys talking, but breaking up badly on 466 Simplex. [edit- I have no idea what I meant to type for the frequency]. On second thought, tornado warning near McCook, NE, so we doubled back west on I-80. Cameras are in position. The nearest repeater is in Kansas unless it tracks back towards Grand Island. We expect if it starts rotating, it will become a right mover and head more east than north east. Also, the surface temperature here (Grand Island) is higher than when we were in Kearney. We have the potential of a) the thing blowing up when it hits the warmer air and b) ingesting an outflow boundary from this morning’s convection. 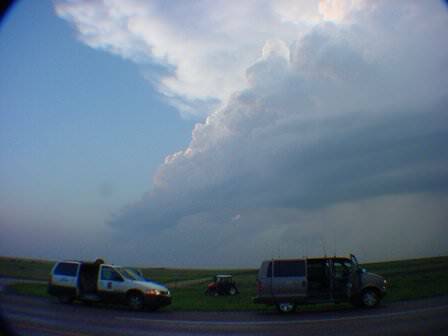 Yesterday, we chased an HP cell around Miller, NE. 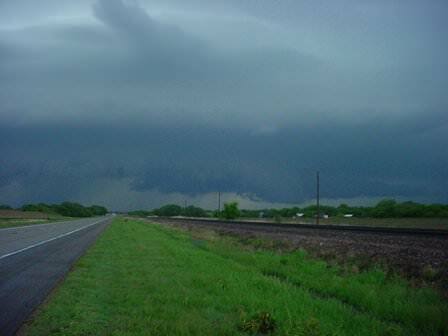 There were 11 cells in the area, two rotating violently, one producing a tornado. The weather channel shows a tornado video from the storm. That was lucky, the storm wasn’t very well organized when that tornado was on the ground. We actually saw it when it was more organized. An interesting feature was dual inflow stingers, which I’ve never even seen a picture of. 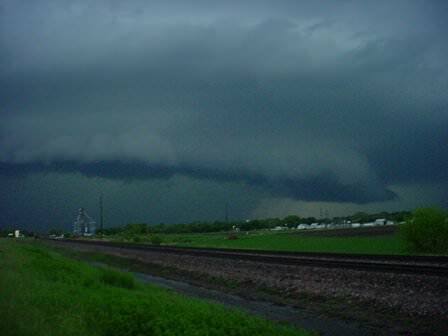 I have it on video, as well as anvil crawlers, several wall clouds, etc. We took US 40 to something to 10 to 2. Spent the night in Travellodge in Grand Island, NE. Today, the CAPE in north-central Kansas looks to be around 2000 J/kg, and it is clear. It also has a lower level shear of 20 kts, which we are expecting to increase. Ran into a really friendly woman in Downs, KS who gave us a ton of maps and Kansas paraphernalia. Gave us a really good tip about a major road being under construction with heavy delays. We picked up a car that is currently following us, but we’ll lose him soon enough. Went 183 to 24, and I picked up Kansas as a new state. 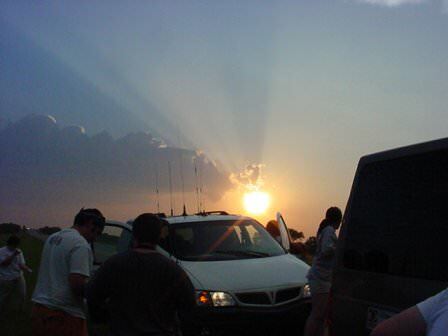 We forecasted a storm to Hays, KS. We arrived south of Hays, where a weak dryline, a frontal boundary, and an outflow boundary from the previous storms were going to meet. A nice cumulus field went up and a tornado watch went up. 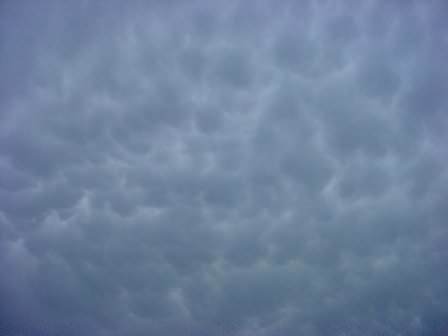 We saw two cells develop; one was very ragged and disorganized, and one looked pretty organized, but maybe a little moisture starved. 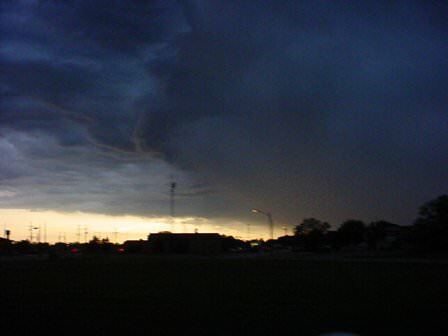 We chased the one to the southwest (the moisture starved one on the dryline) and it fell apart. 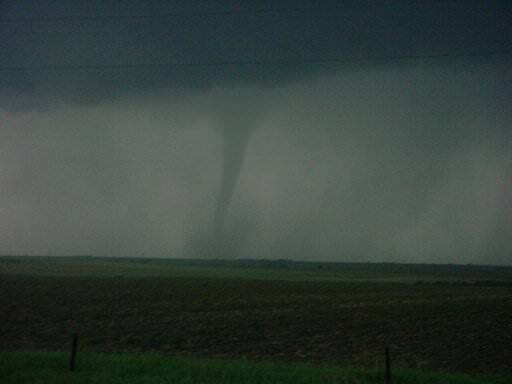 The one to the northeast put a tornado down in Russell, KS. Tough day that way. We spent the night in Hays, KS at a Motel 6. I met W0TOR, from MN, who was on the Russell storm. This morning, I started snapping pictures form the videos of the Nebraska storm. So far, nothing of the inflow stingers, but several good video clips. Talked to dad last night. I was able to power the TinyTrak, sent it programming, but it hasn’t been picked up by a digipeater or anything yet, it still shows us in Japan, 9 days ago. Today, CAPEs of 4000 J/kg, shear of 60 kts, and a strong cap are found around Wichita, but it is most likely overcast. Doesn’t really make sense. SPC had a slight risk over central Kansas, but on the last update, took it down. It’s probably a busted chase day today. Tomorrow, there is a slight risk in IA, NE, KS, and MO, so we might just punt today and head up there. Yesterday’s route was 281 (NE) to 181 (KS) to 24 to 183. 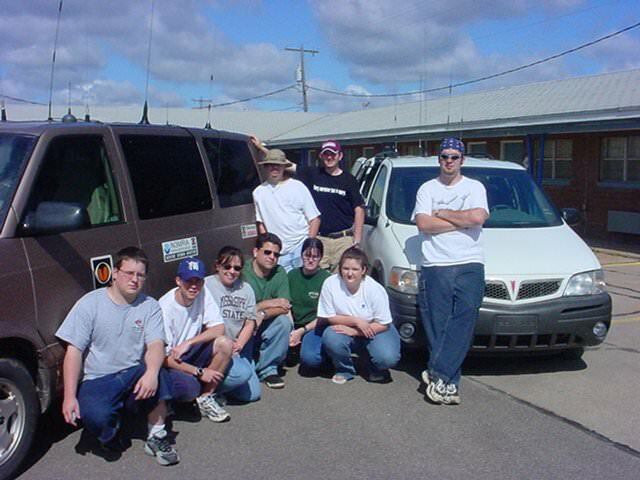 When we actually chased, we went 183 to La Crosse, KS, west on Rt. 4, past McCracken, KS. We then took a dirt road to 183 and went North and South a few times on Rt. 183. Today, we took 183 to 70 to 135 at Salina, KS. 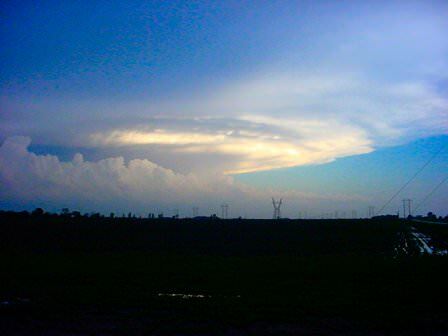 Yesterday, we were in an area of high convection, but nothing could bust through the capping inversion. Busted day. We were going through a ton of back roads that weren’t labelled, making navigation fun. On the way back, van #2 made up a bunch of nerdy meteorology songs that were hilarious. They even made up a fake national weather service “capping warning” for N3MRA, and advised me to get the hell out of Kansas. Brilliant, to say the least. We had some promise this morning. 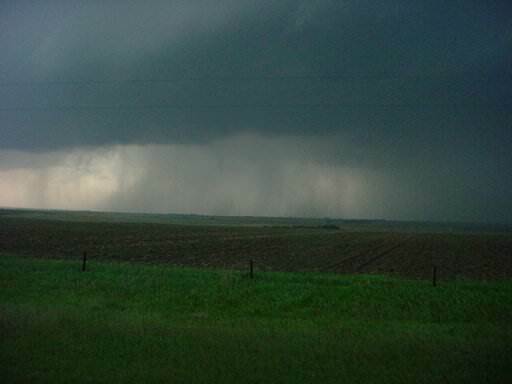 A hatched 15% area of an F2-F5 tornado included western Iowa, Eastern Nebraska, etc. CAPE is approaching 5000 J/kg, shear is at 70 kts, etc. The SPC even staffed extra people today to help out. The problem is, once again, the cloud cover. It has been haunting us all week. We spent last night in the Apple Inn again in Nebraska City. I was too tired to really do too much last night and this morning, as it was a late night. I did, however, get listening to APRS working using a CB antenna and the Icom 281H. We’ve looked at a few weather stations: W0HII and W0NWS, particularly. Today, we went out towards Lincoln, doubled around and came back towards Omaha. We are trying to find a way out of the cloud cover. It’s kind of dismal look so far, but we are working on it. Yesterday was a busted chase. With all the high expectations and all, we did not even get a thunderstorm. In fact, the only things happening in the country were near the Mexico border and in Salem, VA, actually. They had a downburst that damaged the stadium there. Last night, we stayed in the Super 8 in Council Bluffs, IA. It was pretty good, too close to a Burger King, as I spent the last two meals there. I also bought an Iowa T-shirt, since I didn’t feel like doing laundry. Post cards went out today to Jimmy and Mom Mom. 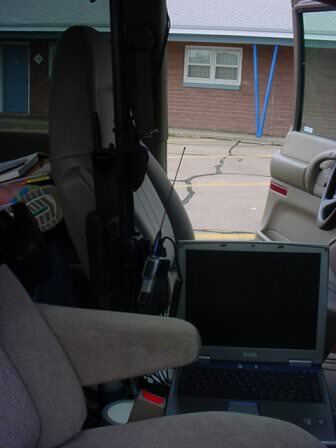 APRS is now transmitting in Van #1 with the Alinco and receiving into UI View from the Icom 281H using the CB antenna to receive. No contacts yesterday, but I did stop and chat with N9ROI and learned a bit about the linking system used on the Des Moines repeater system. Apparently, everything is linked together there, so that’s really cool. Busted chase day yesterday. We were where the only convection was firing, but nothing could break the capping inversion. 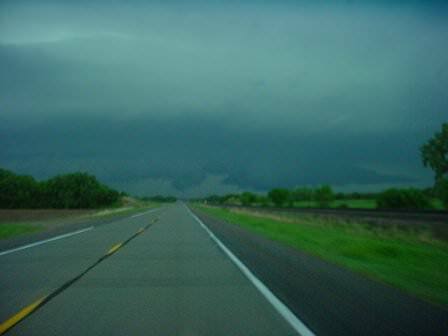 We headed southwest towards Dodge City, KS in hopes of heading towards the panhandle of Texas. As it turns out, the system didn’t develop, so we spend today headed back towards the KS/NE border, hoping for the best. It’s at least sunny today. We stayed at the Econolodge in Dodge City, KS. It was hot and humid tonight. [Another edit: 5/22/2004 was a busy day. We caught two tornadoes, and I had zero time to get a journal entry posted. 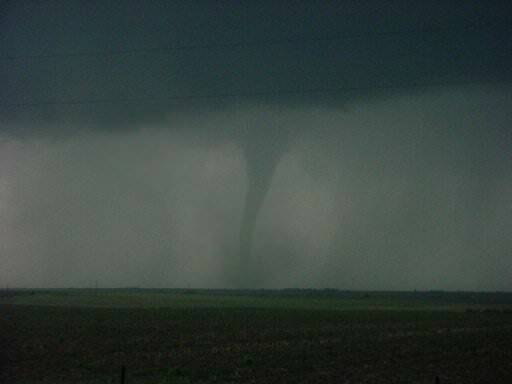 It was a pretty spectacular day for us- we had a bomb-proof forecast, and there was a large tornado that we saw form before our eyes. 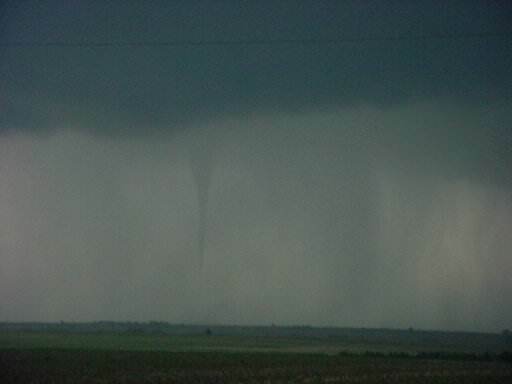 Unfortunately, this storm caused at least one death and destroyed the town of Hallam, NE, though our tornado had lifted and another one formed. 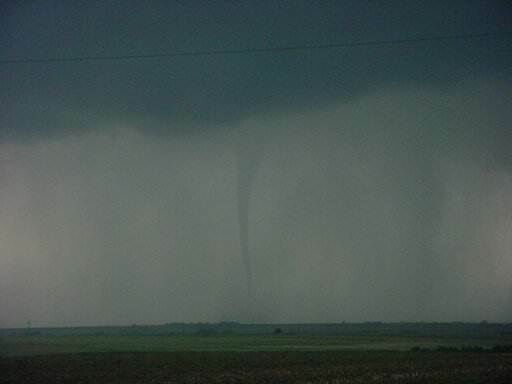 The Hallam tornado was one of the widest ever recorded, until 2013’s El Reno tornado that killed three veteran storm chasers. The day could best be characterized by “hurry up and wait.” We spent a long time at Bosselman’s Travel Plaza in Grand Island, NE. We watched as some of the clouds burned off, but the weather just felt like storms. The air was muggy and breezy (from the southeast). The leaves in the trees were also moving, and you could hear and see them folded upwards with the rising air. 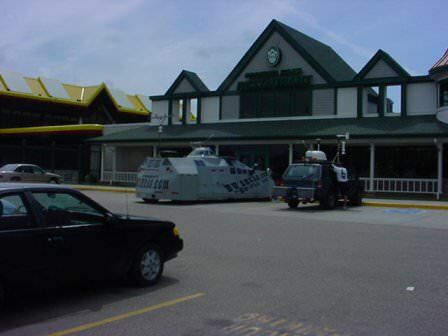 We watched as other storm chasers slowly tricked into the large truck stop. After dodging several news crews, we set out on I-80 westbound and watched one storm form. At first, we almost dropped towards a more eastern storm, trying to learn from our mistakes during the Russell County, KS storm a few days earlier. However, the more western storm looked stronger, and we reasoned that as long as it didn’t eat up the eastern storm’s cool outflow, it would continue to strength. The western storm gobbled up the cool outflow from the eastern storm- but then it also ate its warm inflow. I’ve never seen a storm overtake another storm quite like that. 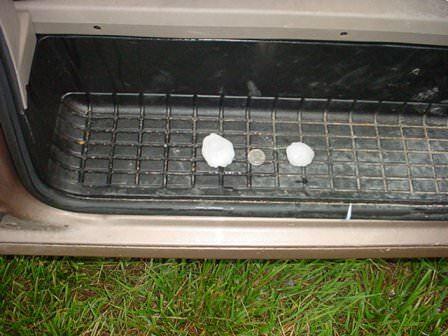 We headed south towards Furnas County, NE and just barely beat the large hail (baseball sized). With a clear route to our south, and the storm moving northeast, we pulled over and watched the wall cloud rotate and then slowly drop a tornado. 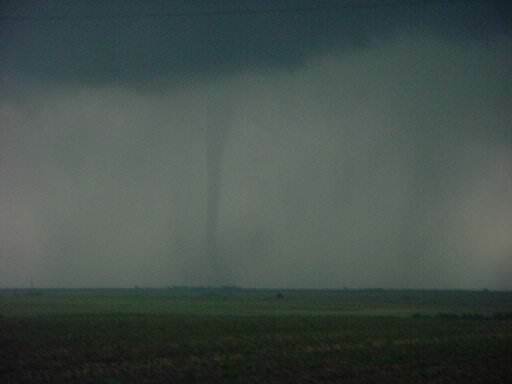 We watched a tornado form from the very beginning. 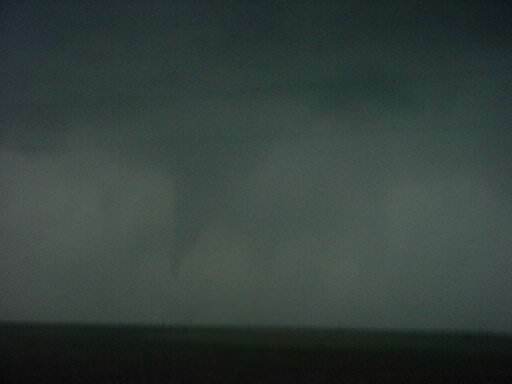 I took several tens of photos of the tornado as it descended. 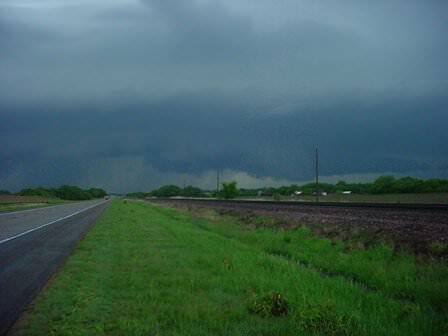 However, the rain began to wrap around the tornado, and we decided to start heading south. There was, however a problem. 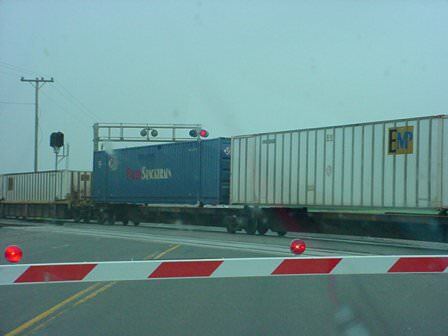 Nebraska Highway Patrol had blocked the entire road. We had to wait for him to do a ten point turn to move his car. Behind us, there was Ball State, Penn State, and a dozen other storm chase vehicles who were closer to the path of the tornado. That wasn’t the problem. The real problem was that this storm produced a satellite vortex that circled around the edge of the ever-approaching wall cloud. I remember thinking we were in good position, but I worried for the folks behind us. Thankfully, it crossed the road with little incident, and no storm chasers in the way. Friday, we spent the day chasing a storm through Canker City, KS. 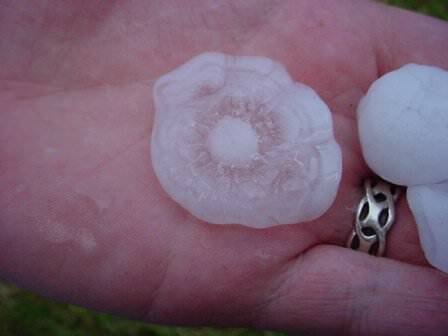 We ran into some pretty heavy hail, it had a TVS, too. 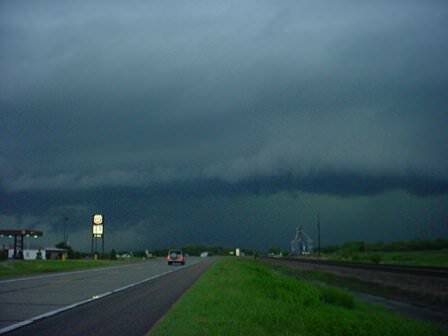 We approached from the northwest though, so we went through part of the hook, saw no tornado, but we did see several wall clouds. The storm put off such an incredible lightning storm, we had to pull over. The National Weather Service Warning included the phrase ‘continuous cloud to ground lightning’ and they weren’t exaggerating. We spent the night in the XL Motel in Hastings, NE. Yesterday, we found ourselves right in the middle of a tornado watch box. 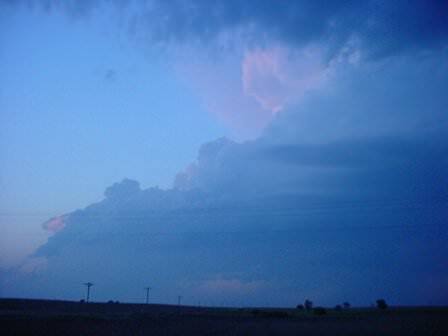 We drove to Grand Island, NE and waited for the storms to fire. While there, we ran into a Penn State group with three DOWs, some guys from the UK, and an IMAX film crew. The storms started firing and we drove maybe 45 minutes southwest. 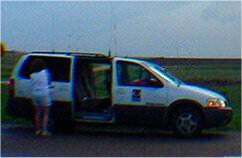 I talked to W0WWT, KC0DXA and KC0RAR to find where the first tornado was located. 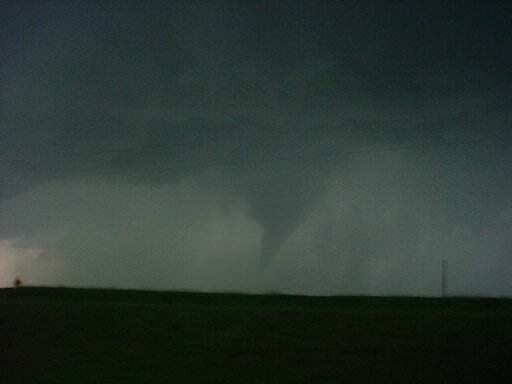 We drove south of Holdrige and saw the second tornado generated by this storm. We watched it form, and then get wrapped in rain. 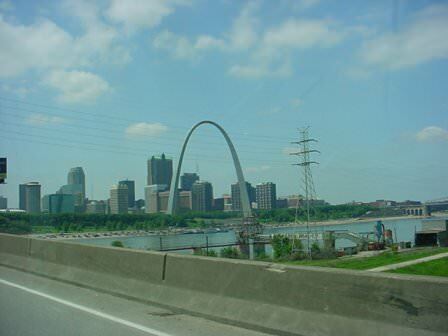 As soon as it started to wrap, we drove away, only to get caught in traffic leaving the cell. We got caught in the RFD, which was pumping out 80mph winds, hail, etc. Then Daniel comes across and says ‘tornado, th-th-three o’clock’ and sure enough a second tornado had formed about 200 yards to our right. 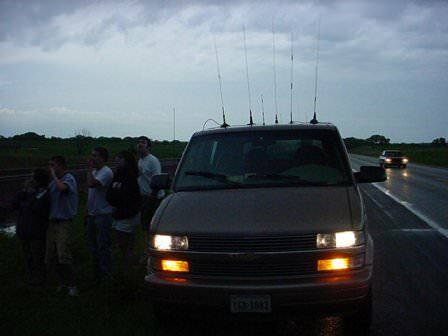 We were caught in a caravan, but luckily all of us got past the tornadoes before they crossed the road. A little ways down the road, we ran into some damage. A lot of damage. Irrigation flipped over, trees down, power lines down, mobile homes flipped over, it was pretty bad. 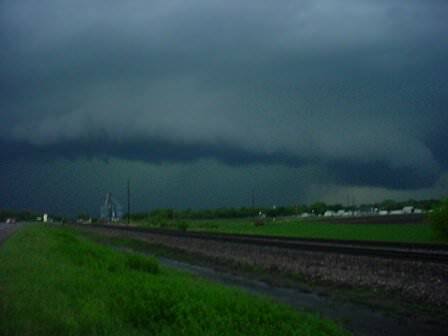 So far, at one point there were 29 tornadoes on the ground, 4 1/2 inch hail confirmed, 1 confirmed fatality, Hallan, NE was wiped off the map, a train derailed, etc. Pretty bad stuff. 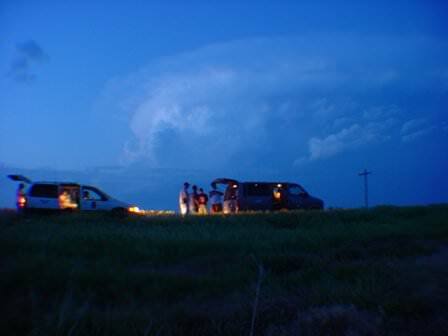 I hope you enjoyed the photos and the story of the 2004 Storm Chase!